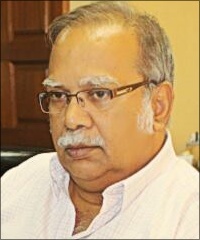 “The primary concern of the organizers is to examine critically the report published by the Office of United Nations High Commissioner for Human Rights (UNHCHR) or the OISL Report on the extent of human rights violations in Sri Lanka and those responsible,” the long time advocate of the rights of Eezham Tamils said in his article. The OISL Report in its recommendations thinks that Sri Lanka government alone is not capable of investigating the crimes against humanity and that the presence of international lawyers, prosecutors and judges are necessary through the establishment of hybrid court to take to task those responsible for crimes against humanity. The US Resolution supported by a number of countries thinks that a domestic inquiry should be sufficient to investigate breaches of international law, international human rights conventions and domestic laws. Although the US Resolution is not against international inquiry, it leaves the matter to be decided by the Sri Lankan government. The Tamils, the most affected segment of the Sri Lankan population, have been taken aback by the non-seriousness of the US Resolution, Ramasamy said in his article announcing the intention of the forthcoming conference in Penang. Given the limited space, attendance to the forum is by invitation only, he added. Last year around November, the Penang Society of Advancement of Tamils (PSAT) organized an international conference on Tamils with the sub-theme of “in search for an identity". One of the topics that were discussed was the extent of human rights violations in Sri Lanka and why the international community was dragging its feet in terms of investigation and punishing those responsible for crimes against humanity. This year, on 21st November 2015, PSAT will be organizing an international forum with a specific focus on human rights violations in Sri Lanka and the way forward. The primary concern of the organizers is to examine critically the report published by the Office of United Nations High Commissioner for Human Rights (UNHCHR) or the OISL Report on the extent of human rights violations in Sri Lanka and those responsible. The Tamils, the most affected segment of the Sri Lankan population, have been taken aback by the non-seriousness of the US Resolution. It is argued that the US Resolution welcomed by the Sri Lankan government would not do justice to those Tamils who have been gravely injured by the cruel and inhuman practices of the Sri Lankan government. Serious political debate is raging in international circles about what should be done in Sri Lanka and to what extent the US Resolution would be able to address questions of justice, truth and reconciliation among Tamils. While the OISL Report provides an excellent framework and substance for the conduct of an international investigation with the presence of foreign judges and prosecutors, however, the US Resolution tends to pour cold war on this excellent initiative. Recent events indicate, that hundreds if not thousands of Tamil prisoners are languishing in the various jails in Sri Lanka without trial. Many of them were detained under the Prevention of Terrorism Act (PTA) under the former regime of Mahinda Rajapakse. Recently, these Tamil prisoners went on hunger strike and demanded that they be released unconditionally. It is indeed ironic, that President Sirisena who promised truth, justice and reconciliation for Tamils, has failed to address the serious human rights plight of Tamils in the country. Since the prisoners’ plight has not been seriously addressed, many are wondering how the present government would be able to address and punish those responsible for crimes against humanity. The Penang international forum on human rights violations hopes to raise the matter of the OISL Report and serious concerns of the crimes against human rights violations in Sri Lanka. Some of the speakers would be able to critically examine the implications of a purely domestic inquiry and to what extent it will address questions of truth, justice and reconciliation principally amongst the Tamil population in Sri Lanka. There are international as well local speakers. The forum will be officiated by Lim Guan Eng, the Chief Minister of Penang. The two keynote presentations will be provided by Lim Kit Siang, DAP (Democratic Action Party) and member of parliament, Gelang Patah, and Vaiko, the Secretary General of MDMK political party from Tamil Nadu, India. Lim Kit Siang will speak on Malaysia's stand on human rights situation in Sri Lanka whereas Vaiko will address the question as to why international investigation is the need of the hour for Sri Lanka. The other speakers at this forum are: Manika Vasagar from Australia, P. Ramasamy, Penang, members of parliament M. Kulasegaran, Zaril Khir Johari and Steven Sim, Mohammed Sabu (Parti Amanah Negara), Kolathur Mani, from Tamil Nadu, India, and Ananthi Sasitharan, Jaffna, Sri Lanka. 16.11.15 Hunger strikers: ‘USA, co-sponsors of consensus-resolution r..
11.11.15 South Africa to Singapore: global Tamils grasping geopolitic..